BAGHDAD, Iraq (CNN) -- In a good will gesture to militant groups, the Iraqi government has freed a man who had been held in connection with the killing of five U.S. soldiers, a government spokesman said Tuesday. 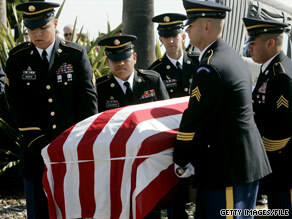 U.S. soliders carry the coffin of Capt. Brian Freeman, one of five soliders dead after a 2007 attack in Karbala, Iraq. The release of Laith al-Khazali on Sunday comes after recent media reports that he would be among a number of militiamen -- all with links to Iran -- who would be released in exchange for the freeing of five British hostages. Iraqi government spokesman Ali al-Dabbagh said al-Khazali's release was not linked to any rumored negotiations about the British hostages or to any other deal. Al-Khazali's release was a gesture by the Iraqi government as part of the national reconciliation process with militant groups, al-Dabbagh told CNN. Al-Khazali was detained in March 2007 along with his brother, Qais, in connection with the killing two months earlier of five U.S. soldiers who were in the central city of Karbala. In that attack, nine to 12 gunmen in five SUVs, wearing "American-looking uniforms" and carrying "U.S.-type weapons," drove through checkpoints before opening fire on U.S. soldiers in the Karbala government compound, the U.S. military said. One soldier was killed at the scene. The attackers drove off with four other soldiers, three of whom were later found fatally shot in a neighboring province and one of whom was found alive with a gunshot wound. That wounded soldier died en route to a hospital, the military said. The slain soldiers were: Capt. Brian S. Freeman, 31, of Temecula, California; 1st Lt. Jacob N. Fritz, 25, of Verdon, Nebraska; Spc. Johnathan B. Chism, 22, of Gonzales, Louisiana; Pfc. Shawn P. Falter, 25, of Cortland, New York; and Pfc. Johnathon M. Millican, 20, of Trafford, Alabama. The al-Khazali brothers are suspected of being part of an EFP (explosively formed projectiles or penetrators) network with ties to the Karbala attack, the military has said. The U.S. government has said the EFPs are being provided to Shiite groups in Iraq by the Iranian Revolutionary Guard's Quds force. Last month, the U.S. military identified the main seven Sunni and Shiite groups that make up the Iraqi insurgency. Among them was Al-Khazali's group, League of the Righteous, a Shiite group also known as Asaib ahl al-Haq, or AAH. Attacks by AAH are not against the Iraqi government, but instead oppose foreign military forces in the country, the U.S. military said. "As security improves and the Iraqi security forces mature, a few Shia extremist groups are now attempting to engage the government of Iraq in the reconciliation process," the U.S. military said. "AAH opposes the coalition presence and has publicly claimed over 6,000 attacks," the military said in its description of the group, adding it was formed with the support of the Quds force. The leadership of AAH fell out with Iraqi Shiite cleric Muqtada al-Sadr in 2006, and since then, al-Sadr has publicly challenged AAH leaders and implied that they have abandoned the resistance by negotiating with the coalition, the U.S. military says. Al-Khazali was transferred from U.S. to Iraqi custody as part of the gradual handing over of detainees that began at the start of the year, al-Dabbagh said. It was not clear when al-Khazali entered Iraqi custody. His brother, Qais al-Khazali, remains in U.S. custody, the military said. Britain has repeatedly appealed for the release of the five British hostages, who were kidnapped May 29, 2007, from an Iraqi Finance Ministry building in Baghdad. Four of the Britons worked for Canada-based security firm GardaWorld, according to the company. They were protecting the fifth Briton, a computer analyst with U.S.-based BearingPoint.